The Simpsons is an Emmy Award-winning American animated sitcom created by Matt Groening for the Fox Network. 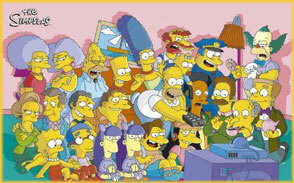 It is a satirical parody of the "Middle American" lifestyle consisting of Homer, Marge, Bart, Lisa and Maggie. Set in the fictional town of Springfield, the show lampoons many aspects of the human condition, as well as American culture, society as a whole and even television itself.